Gyprock Soundchek is a high density gypsum plasterboard with increased noise absorption properties for residential and commercial walls and ceilings where superior acoustic resistance is required. 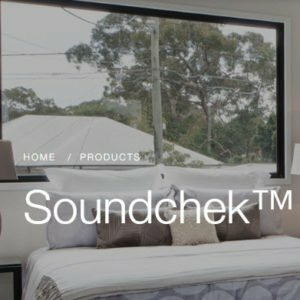 Soundchek provides effective airborne noise and impact noise insulation. Higher levels of noise control can be achieved by including bulk acoustic insulation in the Soundchek wall cavity. Gyprock Soundchek provides sound control worth shouting about. This high density gypsum plasterboard has improved sound transmission properties to help maintain the peace when used in residential and commercial walls and ceilings. The 13mm product is suitable for use in commercial projects in areas where noise transfer can be a concern such as; meeting rooms, intertenancy walls in multi-residential developments, bedrooms and ensuites in hotels and hospitals, acoustic bulkheads and shafts. © 2016 MADEX Plaster Pty Ltd.